Santa is a big deal in our house. Letters are written and given to Hermey, our Elf on the Shelf, for safe passage. Santa’s personality and lifestyle choices are hotly debated (“Where do you think he vacations? Does he brush his teeth?”). Notes for Santa are left at bedsides. Over the years, I have done nothing to diminish Ella and Annie’s belief in Santa; on the contrary, I’ve encouraged it. Stocking gifts are wrapped just so every Christmas and placed outside the girls’ bedrooms. Hermey has brought back letters from St. Nick bearing the North Pole postal cancellation. If a gift wasn’t able to be procured, Santa has provided a written explanation. He might even get “caught” in our living room Christmas photos every year. See, I love Christmas. I also love magic and wonder and hope, all of which continue to bloom and surround the girls every Christmas season. For that, I am thrilled. There is so damned much in the world today that is all too sad, practical, and heavy. Despite how hard we try to protect our kids from losing loved ones, financial difficulties, work-related stress, divorce, etc., we cannot. Beyond our own homes, our 24/7 media make it all but impossible for even children to avoid at least some exposure to natural disasters, refugee crises, racial tensions, gun violence, diseases, deaths of celebrities, politics. 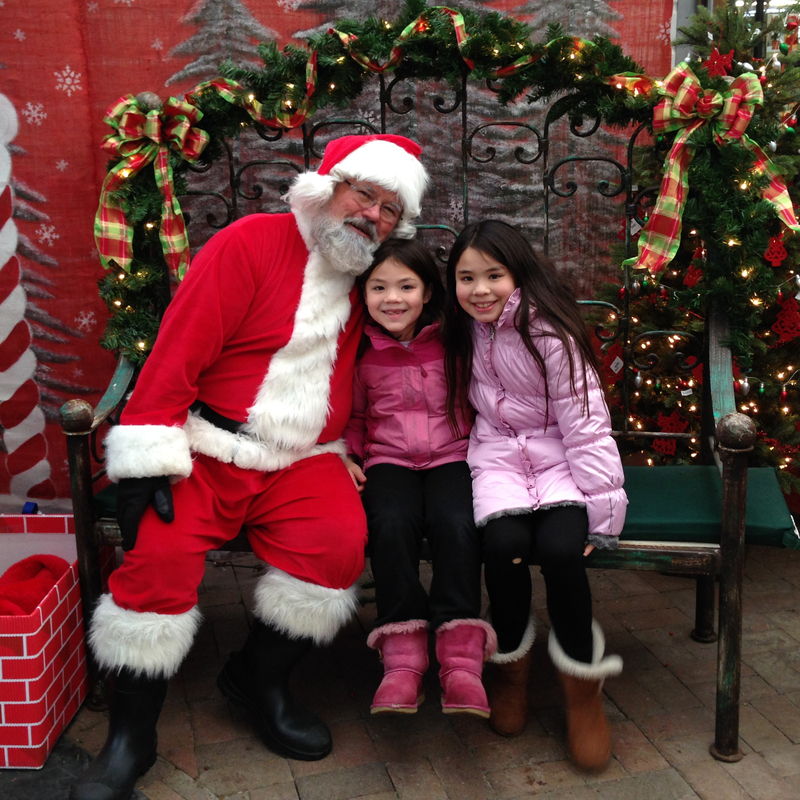 Allowing our girls to put aside the all-too-real world, allowing them to experience awe and joy and delighted anticipation through Santa, allowing them to believe in something magical – to just be kids for a little while longer (while simultaneously celebrating the happiness that is Christmas) – has been one of my most important and fulfilling decisions as a parent. That they have so adored Santa and all he represents to them – love, mischief, kindness, generosity – and that they have felt so loved in return has made that decision even more wonderful. 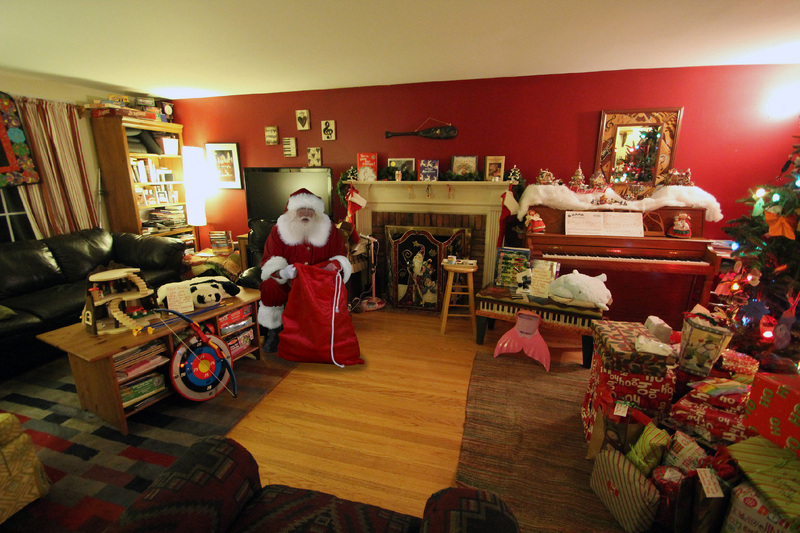 Because Santa is so special to Ella and Annie, I have gone to great lengths to protect him. Questions were answered with deliberate and measured responses that were never misleading but never laid everything on the table, either. They didn’t really want to know. So we didn’t tell them. It was complicated too, though, because keeping up the myth of Santa in the age of live streaming and Google searching and school bus taunting is, quite frankly, exhausting. Still, we’d made it through this holiday season with the girls writing letters to Santa and placing them beside Hermey, leaving food for the reindeer on Christmas Eve, and genuinely being thrilled that “he remembered” everything they asked for on Christmas morning. They believed for another year. I breathed a sigh of relief and thought no more of it. Apparently, despite maybe not wanting to know the truth, Ella was ready to hear it after all. There was only one (big) problem: Annie, who was sitting three feet away. At two years Ella’s junior, Annie still very much believes – and, despite her curiosity and bravado, it was quickly obvious that Annie really, really, really did not want to hear the answer to Ella’s question. After volleying back and forth for a bit, Ella agreed to table the discussion for a later time. I was relieved – not only for Annie’s sake, but also because it meant I’d have the opportunity to prepare for how I’d planned, for years, to break the Santa News… via a letter I’d seen on the internet. The gist was this: explain that we are not, in fact, Santa – but we act as Santa and fill her stocking, buy her “Santa” gifts, etc; let her know that we think believing in Santa and acting as Santa are tremendously important and are about sharing love, kindness, wonder, and hope; and that, now that she was “in” on it, we would like her to preserve the magic of Santa for those who still believe (see: Annie). I was not at all sure how this would go over. I’ve heard stories of kids who were furious with their parents for, as they saw it, lying to them. I’ve heard of others who were so upset and heartbroken, they fell apart. Nick and I crossed our fingers that Ella would see it as we did: that believing in Santa felt so amazing and brought her such happiness, and “real life” is so pressing and heavy, we wanted to preserve this bit of childhood for as long as we could. At bedtime, we checked to see if Ella wanted to hear a more detailed answer to her earlier question. She hesitated for a moment, but ultimately decided that yes, she did. She was finally, truly ready. Rather than read the letter herself, Ella asked me to do it. When my voice hitched at the part about how we hoped she would continue these traditions for her own children someday, I discovered the other reason I’ve gone to such lengths to keep Santa all these years: because I loved it so much. I loved how earnestly the girls debated which reindeer was Santa’s favorite. I loved how carefully they looked over the cookies each Christmas Eve, selecting the ones that were just right. I loved the twinkle in their eyes as they flew down the stairs on Christmas morning, eager to see if he’d actually come. Simply, I adored the deep-seated joy that Santa brought them; playing a part in cultivating that joy was one of my favorite parts of Christmas, of being a parent. Ella had a few other queries, most of which we answered. I did, however, flat-out refuse to explain how Santa’s image appears in our photos each year or how I create Hermey’s handwriting; some things are meant to be kept secret. To our delight and relief, after some time to process and assimilate, Ella seemed to feel exactly the way we did about Santa. Although I’m sure she was disappointed that a plump, omniscient, bearded elf does not, in fact, deliver her presents each year, she took in our explanation and made it her own. She also informed me that she will still be leaving a letter with Hermey to deliver to Santa… because that’s just what we do, and that’s the truth. Every year, we visit the same Santa Claus. I don’t just mean the same place or the same general “Santa,” but actually the very same human being. We discovered him a good many years back when we went to get our Christmas tree at a local nursery and stumbled upon a Christmas Open House they were hosting. The great part of this is that “our” Santa actually remembers the girls, which makes them feel pretty fantastic. (It doesn’t hurt that Santa hands out little goodie bags filled with candy, a coloring book, and these awesome glasses that “react” to bright lights and make it seem as though snowflakes or gingerbread men are dancing around the bulbs of your Christmas tree. Side note: wearing these glasses while driving is not advised.) The best part of this – or so I thought – is that Ella and Annie believe, to their core, that this is THE Santa Claus, so they feel like they’re in on a secret and basically the coolest, luckiest girls on the planet. This belief began because “our” Santa has a real beard, unlike the Santas they’d met previously. It was cemented because they’ve seen photo evidence of Santa delivering presents to our house on Christmas Eve and (coincidentally) The Real Mr. Claus looks remarkably like the Santa at our local nursery. I will fully accept responsibility, and declare myself guilty, for this deception because Annie and Ella’s belief in Santa – their desire for him to be real – is so strong and deep, I am willing to do almost anything to protect it; this is a ruse that I am absolutely willing to perpetuate. But as for the photo Santa resembling “our” Santa? MAMA GOT LUCKY THERE, FOLKS. If you want to be creepy magical like me, check out this website. When we arrived at the Christmas Open House on Saturday, our sole purpose was to see Santa; we’d already gotten our tree last week, so we only planned to stay for a few minutes, chat with St. Nick, grab the goodies, and leave. The moment we approached him at his bench, his face brightened and his smile beckoned them over. He invited them to sit beside him and they made a little small talk, during which Santa mentioned that “your elf has been filling me in – he says that you’ve been pretty good this year!” Ella snuck a glance my way, one that showed me she was thinking what I was: How the heck does Santa know for sure that we have an elf (on the shelf)? We do, but wouldn’t that kind of blow his cover if we didn’t? 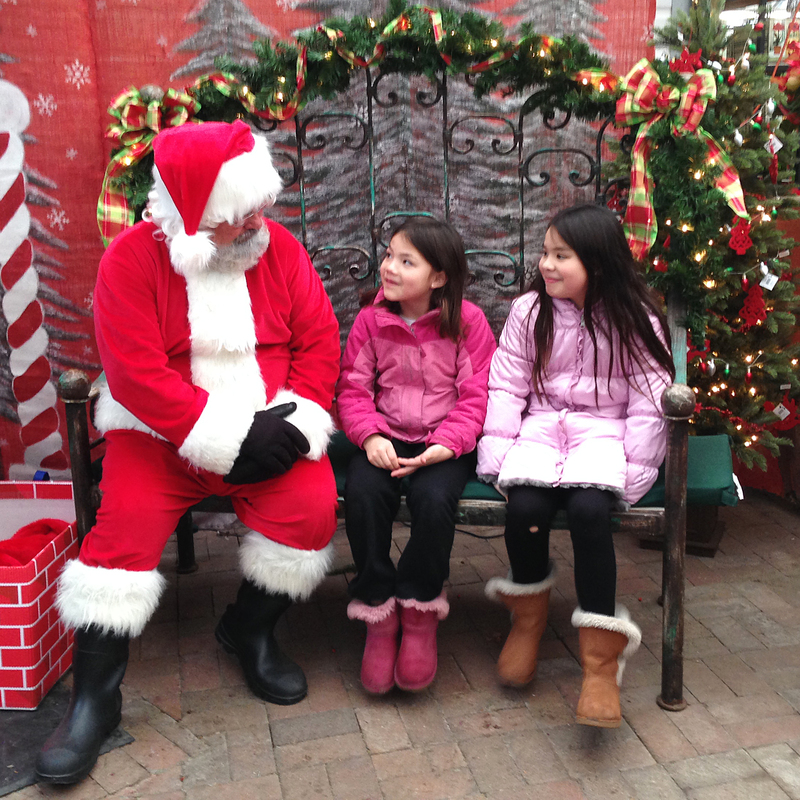 Naturally, Jolly Old St. Nicholas asked the girls what they’d like for Christmas. Annie listed her three items (the agreed upon appropriate number) and then Ella had her turn, telling him she’d like “an electronic writing thing” (actually a Boogie Board; Santa said he’d talk to the elves about it), a bracelet maker, and an American Girl doll. He laughed at that one, asking her, “Didn’t you get one of those last year?” She laughed back and agreed that she had – to which he replied, “But you can never have too many of those, can you? You need another to keep the first one company!” – and then she shot me The Look again. Because, yes, she had received an American Girl doll last year, but it seemed unlikely that “Santa” would have remembered such a thing 365 days, and countless visitors, later. It seemed especially unlikely because Ella had never mentioned it to Santa at all; Nick and I had given her that doll last Christmas. Still dazed from the mystical Santa visit, I noticed that the nursery was selling well-priced poinsettias and Christmas cactuses (cacti? ), which we give to the girls’ teachers each year, so I sent them over to look at the plants and select the ones they wanted. Meanwhile, I approached the cashiers for a large box in which to put our purchases. As I waited, The Man With All The Toys left his post and came up to me. Oh, my goodness. Thank YOU so much for remembering them! Thank you very much. Visiting you is one of our Christmas traditions each year. I know they won’t believe forever, but for now, they do, and you make magic for them each time we’re here. Thank you for the magic. I still have no idea how he knew that we have an elf on the shelf, or that Ella and Annie received American Girl dolls last year. It could have been dumb luck – it probably was dumb luck – but it was pretty uncanny. 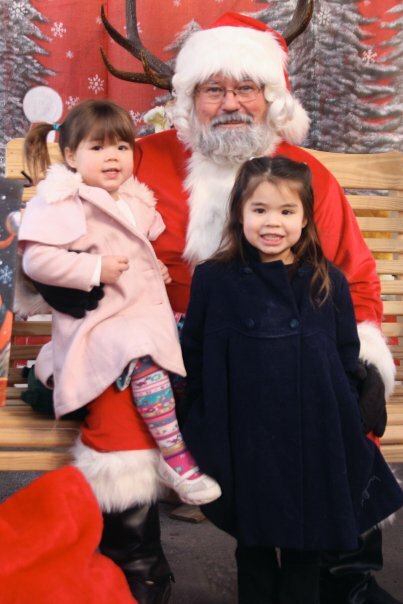 Whatever the reason, my girls came away from our visit floating on air, certain that Santa Claus himself had just given them a hug and told them that they’d been good this year. And hey… you just never know. Christmas magic, my friends, indeed. That is the very, very best part.